Beresheet 19:37The firstborn bore a son and called his name Mo'av; he is the father of the Mo'avites to this day. Beresheet 19:38 The younger also gave birth to a son, and she called him Ben-`Ammi; he is the ancestor of the people of `Amon to this day. When Husham died, Hadad the son of B'dad, who killed Midyan in the field of Mo'av, reigned in his place; the name of his city was `Avit. Moab ; Moabite Hebrew: מוֹאָב, Modern Mo'av Tiberian; "seed of father"; Greek Μωάβ Mōav; Assyrian Mu'aba, Ma'ba, Ma'ab ; Egyptian Mu'ab) is the historical name for a mountainous strip of land in Jordan. then the chiefs of Edom are dismayed; trepidation seizes the heads of Mo'av; all those living in Kena`an are melted away. From Ovot they traveled and camped at `Iyei-Ha`avarim, in the desert fronting Mo'av on the east. From there they traveled and camped on the other side of the Arnon, in the desert; this river comes out of the territory of the Emori; for the Arnon is the boundary between Mo'av and the Emori. and the slope of the vadis extending as far as the site of `Ar, which lie next to the territory of Mo'av." and from Bamot to the valley by the plain of Mo'av at the start of the Pisgah range, where it overlooks the desert. Heshbon was the city of Sichon, the king of the Emori, who had fought against the former king of Mo'av and conquered all his land up to the Arnon. "For fire burst out of Heshbon, a flame from the city of Sichon. It consumed `Ar of Mo'av, the lords of Arnon's high places. "Woe to you, Mo'av! You are destroyed, people of K'mosh! He let his sons be fugitives and his daughters captives of Sichon, king of the Emori. Then the people of Yisra'el traveled on and camped in the plains of Mo'av beyond the Yarden River, opposite Yericho. Mo'av was very afraid of the people, because there were so many of them; Mo'av was overcome with dread because of the people of Yisra'el. So Mo'av said to the leaders of Midyan, "This horde will lick up everything around us, the way an ox licks up grass in the field." Balak Ben Tzippor was king of Mo'av at that time. The leaders of Mo'av and Midyan left, taking with them the payment for divining, came to Bil`am and spoke to him the words of Balak. He said to them, "Stay here tonight, and I will bring you back whatever answer ADONAI (יהוה) tells me." So the princes of Mo'av stayed with Bil`am. The princes of Mo'av got up, returned to Balak and said, "Bil`am refuses to come with us." So Bil`am got up in the morning, saddled his donkey and went with the princes of Mo'av. When Balak heard that Bil`am had come, he went out to meet him in the city of Mo'av at the Arnon border, in the farthest reaches of the territory. He came to him and stood by his burnt offering, with all the princes of Mo'av. Balak asked him, "What did ADONAI (יהוה) say?" "I see him, but not now; I behold him, but not soon -- a star will step forth from Ya`akov, a scepter will arise from Yisra'el, to crush the corners of Mo'av and destroy all descendants of Shet. Yisra'el stayed at Sheetim, and there the people began whoring with the women of Mo'av. These are the ones counted by Mosheh and El`azar the cohen, who took a census of the people of Yisra'el in the plains of Mo'av by the Yarden across from Yericho. and brought the captives, booty and spoil to Mosheh, El`azar the cohen and the community of Yisra'el in the camp on the plains of Mo'av by the Yarden across from Yericho. They moved on from Ovot and camped at 'Iyei-Ha`Avarim, by the border of Mo'av. 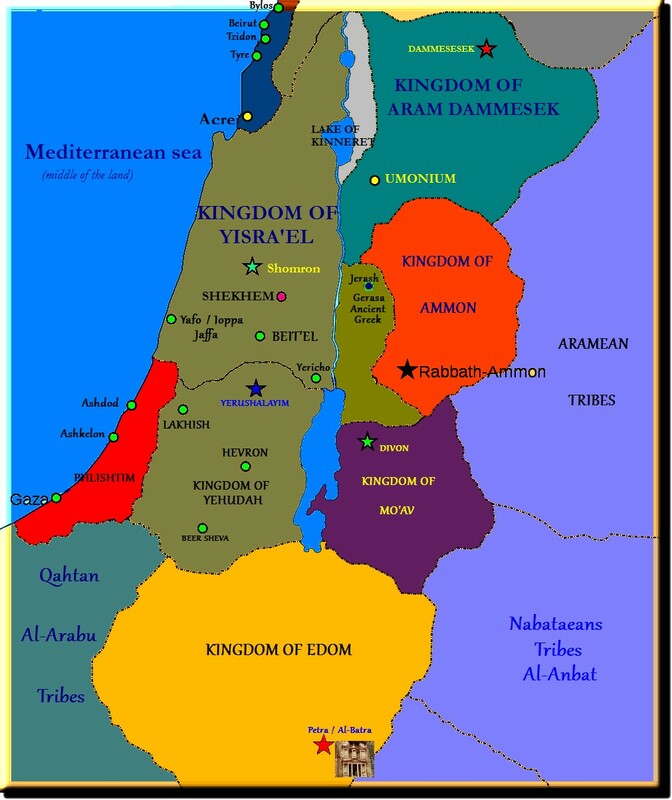 They moved on from the `Avarim Range and camped in the plains of Mo'av by the Yarden, across from Yericho. Their camp by the Yarden extended from Beit-HaYeshimot all the way to Avel-HaSheetim in the plains of Mo'av. These are the mitzvot and rulings which ADONAI (יהוה) gave through Mosheh to the people of Yisra'el in the plains of Mo'av by the Yarden, across from Yericho. "So we went on past our kinsmen the descendants of `Esav living in Se`ir, left the road through the `Aravah from Eilat and `Etzyon-Gever, and turned to pass along the road through the desert of Mo'av. 'Today you are to cross the border of Mo'av at `Ar. 28:69These are the words of the covenant which ADONAI (יהוה) ordered Mosheh to make with the people of Yisra'el in the land of Mo'av, in addition to the covenant which he made with them in Horev. "Go up into the `Avarim Range, to Mount N'vo, in the land of Mo'av across from Yericho; and look out over the land of Kena`an, which I am giving the people of Yisra'el as a possession. So Mosheh, the servant of ADONAI (יהוה), died there in the land of Mo'av, as ADONAI (יהוה) had said. He was buried in the valley across from Beit-P`or in the land of Mo'av, but to this day no one knows where his grave is. The people of Yisra'el mourned Mosheh on the plains of Mo'av for thirty days; after this, the days of crying and mourning for Mosheh ended. These are the inheritances which Mosheh distributed in the plains of Mo'av, beyond the Yarden and Yericho, eastward. Then Balak the son of Tzippor, king of Mo'av, rose up and fought against Yisra'el. He sent and summoned Bil`am the son of B`or to put a curse on you. But the people of Yisra'el again did what was evil from ADONAI (יהוה)'s perspective, so ADONAI (יהוה) strengthened `Eglon the king of Mo'av against Yisra'el, because they had done what was evil from ADONAI (יהוה)'s perspective. and the people of Yisra'el served `Eglon the king of Mo'av eighteen years. But when the people of Yisra'el cried out to ADONAI (יהוה), ADONAI (יהוה) raised up for them a savior, Ehud the son of Gera, from the tribe of Binyamin, a left-handed man. The people of Yisra'el appointed him to take their tribute to `Eglon the king of Mo'av. Then he presented the tribute to `Eglon king of Mo'av. Now `Eglon was a very fat man. He said to them: "Follow me, because ADONAI (יהוה) has given your enemy Mo'av into your hands. They went down after him, seized the fords of the Yarden opposite Mo'av and permitted no one to cross. On that occasion they defeated Mo'av, some ten thousand men, all tough, experienced soldiers; not one of them escaped. Thus was Mo'av subdued that day under the power of Yisra'el. Then the land had rest for eighty years. with this response, "Here is what Yiftach has to say: 'Yisra'el captured neither the territory of Mo'av nor the territory of the people of `Amon. then Yisra'el sent messengers to the king of Edom, to say, "Please let us pass through your land." But the king of Edom wouldn't let them. He sent a similar message to the king of Mo'av, but neither would he, so Yisra'el stayed at Kadesh. Then they walked through the desert, around the territory of Edom and the territory of Mo'av, past the east border of the territory of Mo'av, and pitched camp on the other side of the Arnon; but they did not cross the border into Mo'av, for the Arnon was the border of Mo'av. Really, are you better than Balak the son of Tzippor, king of Mo'av? Did he ever pick a quarrel with Yisra'el or fight with us? Back in the days when the Softim were judging, at a time when there was a famine in the land, a certain man from Beit-Lechem went to live in the territory of Mo'av -- he, his wife and his two sons. The man's name was Elimelekh, his wife's name was Na`omi, and his two sons were named Machlon and Kilyon; they were Efratim from Beit-Lechem in Y'hudah. They arrived in the plain of Mo'av and settled there. They took wives for themselves from the women of Mo'av; the name of the one was `Orpah; and the name of the other was Rut. They lived there for about ten years. So she prepared to return with her daughters-in-law from the plain of Mo'av; for in the plain of Mo'av she had heard how ADONAI (יהוה) had paid attention to his people by giving them food. This is how Na`omi returned, with Rut the woman from Mo'av, her daughter-in-law, accompanying her from the plain of Mo'av. They arrived in Beit-Lechem at the beginning of the barley harvest. The servant supervising the reapers answered, "She's a girl from Mo'av who returned with Na`omi from the plain of Mo'av. Then he said to the redeeming kinsman, "The parcel of land which used to belong to our relative Elimelekh is being offered for sale by Na`omi, who has returned from the plain of Mo'av. But they forgot ADONAI (יהוה) their Elohim; so he handed them over to Sisra, commander of the army of Hatzor, and to the P'lishtim, and to the king of Mo'av; and they fought against them. So Sha'ul took over the rulership of Yisra'el. He fought against all his enemies on every side -- against Mo'av, the people of `Amon, Edom, the Melekhim of Tzovah and the P'lishtim. No matter which way he turned, he defeated them. David went from there to Mitzpeh of Mo'av and said to the king of Mo'av, "Please let my father and mother come and stay with you until I know what Elohim will do for me." He presented them to the king of Mo'av, and they lived with him as long as David remained in his stronghold. He also defeated Mo'av; making them lie down on the ground, he measured them with a length of cord; for every two lengths to be put to death he designated one length to be kept alive. The people of Mo'av became subjects of David and paid tribute. Aram, Mo'av, the people of `Amon, the P'lishtim, `Amalek, and the spoil taken from Hadad`ezer son of Rechov, king of Tzovah. B'nayah the son of Y'hoyada, the son of a valiant man of Kavtze'el, was a man of many exploits. He struck down two lion-hearted men of Mo'av. One day when it was snowing, he went down into a pit and killed a lion. Shlomo built a high place for K'mosh the abomination of Mo'av on the hill in front of Yerushalayim, and another for Molekh the abomination of the people of `Amon. I will do this because they have abandoned me and worshipped `Ashtoret the Elohimdess of the Tzidoni, K'mosh the Elohim of Mo'av and Milkom the Elohim of the people of `Amon. They haven't lived according to my ways, so that they could do what was right in my view and obey my regulations and rulings, as did David his father. After Ach'av's death Mo'av rebelled against Yisra'el. Mesha king of Mo'av was a sheep-breeder, and he used to send the king of Yisra'el the wool of 100,000 lambs and of 100,000 rams as tribute. But after Ach'av died, the king of Mo'av rebelled against the king of Yisra'el. He also went and sent this word to Y'hoshafat king of Y'hudah: "The king of Mo'av has rebelled against me. Will you join me in attacking Mo'av?" He answered, "I will join in the attack -- I'm with you all the way; think of my people and horses as yours. "This is terrible!" exclaimed the king of Yisra'el. "Has ADONAI (יהוה) called these three Melekhim together only to hand them over to Mo'av?" Elisha said to the king of Yisra'el, "What do you and I have in common? Go, consult your father's prophets and your mother's prophets!" But the king of Yisra'el answered him, "No, because ADONAI (יהוה) has called these three Melekhim together to hand them over to Mo'av." said, "That's blood! The Melekhim must have quarreled, and their soldiers killed each other. Mo'av! To the plunder!" When the king of Mo'av saw that the fighting was too much for him, he took with him 700 men armed with swords and tried to break through to the king of Edom; but they couldn't do it. After Husham died, Hadad the son of B'dad, who attacked Midyan on the plains of Mo'av, took his place as king; the name of his city was `Avit. Yokim, the men of Kozeva, Saraf the ruler in Mo'av, and Yashuvi-Lechem the records are ancient). He also defeated Mo'av, so that the people of Mo'av became subjects of David and paid tribute. which King David dedicated to ADONAI (יהוה), along with the silver and gold that he had carried off from all the nations -- from Edom, Mo'av, the people of `Amonn, tthe P'lishtim and `Amalek. Some time later, the people of Mo'av and the people of `Amon with other `Amonim came up to fight Y'hoshafat. Then, during the time when they were singing and praising, ADONAI (יהוה) brought a surprise attack against the people of `Amon, Mo'av and Mount Se`ir who had come to fight Y'hudah; and they were defeated. What happened was that the people of `Amon and Mo'av began attacking those people who lived by Mount Se`ir, to kill and destroy them completely; and when they had finished off the people from Se`ir, they set to work slaughtering one another. Malkiyah the son of Harim and Hashuv the son of Pachat-Mo'av made repairs on another section and on the Tower of the Ovens. 60:10Mo'av is my washpot; on Edom I throw my shoe; P'leshet, be crushed because of me!" Mo'av is my washpot; on Edom I throw my shoe; Over P'leshet I shout in triumph." They will swoop down on the flank of the P'lishtim to the west. Together they will pillage the people to the east -- they will put out their hand over Edom and Mo'av, and the people of `Amon will obey them. This is a prophecy about Mo'av: The night `Ar is sacked, Mo'av is ruined. The night Kir is sacked, Mo'av is ruined. He went up to the temple, to Dibon and to the high places, to weep. On N'vo and Meidva Mo'av is howling, every head shaved bald, every beard cut off. Heshbon and El`aleh cry out, they are heard as far as Yachatz. Mo'av's best troops cry aloud, as their courage faints away. My heart cries out for Mo'av! Its fugitives flee to Tzo`ar, a calf three years old. They ascend the slope of Luchit, weeping as they go; on their way to Horonayim, they utter heartrending cries. For the cry has circulated throughout Mo'av's territory -- its howling has reached Eglayim, its howling has reached Be'er-Elim. For the waters of Dimon are full of blood, yet I have worse in store for Dimon -- a lion for those who escape from Mo'av and for those who remain in its land. The daughters of Mo'av at the fords of the Arnon are like fluttering birds pushed from the nest. We have heard about Mo'av's pride, how very proud they are; about their haughty arrogance, their insolence and bravado. Therefore Mo'av will wail for Mo'av -- they will all wail! You will sigh, stricken by grief, for the raisin-cakes of Kir-Hareset. This is why my heart throbs like a lyre for Mo'av, and everything in me for Kir-Heres. Even when Mo'av is seen growing weary of worshipping on the high places and entering their sanctuaries to pray, they will have accomplished nothing. This is the word ADONAI (יהוה) spoke against Mo'av in the past. But now ADONAI (יהוה) has said, "Within three years [and not a day more], as if a hired worker were keeping track of the time, the glory of Mo'av will be brought into contempt, despite its large population; and the surviving remnant will be few and feeble." For on this mountain the hand of ADONAI (יהוה) will rest. But Mo'av will be trampled down where they are, like straw trampled into a pile of manure. 9:25Egypt, Y'hudah, Edom, the people of `Amon and Mo'av, and all those living in the desert who cut the edges [of their beard]: "For although all the Goyim are uncircumcised, all the house of Yisra'el have uncircumcised hearts." Send [similar yokes] to the Melekhim of Edom, of Mo'av, of the people of `Amon, of Tzor, and of Tzidon by means of the envoys they send to Yerushalayim, and to Tzidkiyahu king of Y'hudah. Concerning Mo'av, this is what ADONAI (יהוה)-Tzva'ot, the Elohim of Yisra'el, says: "Woe to N'vo, for it is ravaged; Kiryatayim disgraced and captured. Misgav is put to shame, distressed. "In Mo'av, nothing is left to praise. At Heshbon they plotted her downfall: 'Come, we'll cut her off as a nation.' You too, Madmein, will be silenced; the sword pursues behind you. Give Mo'av wings, so it can fly and get away. Its cities will become ruins, with no one to live in them. Mo'av has lived at ease from his youth; he is [wine] settled on its dregs, not decanted from jar to jar -- he has not gone into exile. Therefore it retains its own [bad] taste, its aroma remains unchanged. Mo'av will be disappointed by K'mosh then, just as the house of Yisra'el was disappointed by Beit-El, a Elohim in whom they had put their trust. They are ravaging Mo'av, attacking its cities; its best young men go down to be slaughtered," says the king, whose name is ADONAI (יהוה)-Tzva'ot. Mo'av's ruin is coming soon, its disaster speeds on swiftly. Descend from your glory, and sit in thirst, daughter living in Divon; for Mo'av's destroyer advances on you; he has destroyed your strongholds. Mo'av is disgraced, indeed, destroyed. Wail aloud! Shriek! Proclaim it by the Arnon that Mo'av has been laid waste. K'riot, Botzrah and all the cities in the land of Mo'av, far and near. "Mo'av's strength is cut down, his arm is broken," says ADONAI (יהוה). Because Mo'av boasted against ADONAI (יהוה), make him so drunk that he wallows in his own vomit and becomes a laughingstock. You who live in Mo'av, leave the cities, and live on the rocks; be like the dove who makes her nest in a hole in the rock at the mouth of a cave. We have heard of the pride of Mo'av: so very proud he is! -- presumptuous, proud, conceited; so haughty his heart! Therefore I wail for Mo'av; for all Mo'av I cry; for the people of Kir-Heres I lament. Gladness and joy have been removed from productive fields and the land of Mo'av. "I have stopped the flow of wine from the vats and the shouts of those who tread the grapes -- those shouts of joy are stilled." "Moreover," says ADONAI (יהוה), "in Mo'av I will put an end to anyone sacrificing on a high place or offering incense to his Elohims." This is why my heart is moaning for Mo'av like funeral flutes, why my heart moans for the men of Kir-Heres like funeral flutes; for the wealth they produced has vanished. On all the housetops of Mo'av and in its open places -- lamentation everywhere! "For I have broken Mo'av like a pot that nobody wants," says ADONAI (יהוה). Wail, "How shattered is Mo'av! How shamefully in retreat!" Thus will Mo'av become an object of ridicule and distress to all its neighbors. the cities are captured, the strongholds are seized. On that day the hearts of Mo'av's warriors will be like the heart of a woman in labor. Mo'av will be destroyed as a people, because he boasted against ADONAI (יהוה). Terror, pit and trap are upon you, people of Mo'av," says ADONAI (יהוה). "Whoever flees from the terror will fall into the pit; and he who climbs up out of the pit will be caught in the trap. For I will bring on her, on Mo'av, the year for her punishment," says ADONAI (יהוה). "In the shadow of Heshbon the fugitives stop, exhausted. For fire breaks out from Heshbon, a flame from inside Sichon, consuming the sides and tops of the heads of Mo'av's noisy boasters. Woe to you, Mo'av! K'mosh's people are doomed! For your sons have been taken captive, and your daughters led into captivity. Yet I will end Mo'av's exile in the acharit-hayamim," says ADONAI (יהוה). This is the judgment on Mo'av. "ADONAI (יהוה) Elohim says: 'Because Mo'av and Se`ir say, "The house of Y'hudah is like all the other nations,"
He will also enter the Land of Glory, and many [countries] will come to grief, but these will be saved from his power -- Edom, Mo'av and the people of `Amon. I will send fire on Mo'av, and it will consume the palaces of K'riot. Mo'av will die with turmoil and shouting, along with the sound of the shofar. My people, just remember what Balak the king of Mo'av had planned, what Bil`am the son of B`or answered him, [and what happened] between Sheetim and Gilgal -- so that you will understand the saving deeds of ADONAI (יהוה)." Therefore, as I live," says ADONAI (יהוה) -Tzva'ot, the Elohim of Yisra'el, "Mo'av will become like S'dom and the people of `Amon like `Amora, a land covered with nettles and salt pits, desolate forever. The remnant of my people will plunder them, the survivors in my nation will inherit them."